Smart, Sustainable, Inclusive. Conference Abstracts. September 28-30, 2016, Bucharest. Challenges. Conference Abstracts. September 16-18, 2014, Lviv. of Forum Carpaticum 2014. Ukrayinskyy Bestseler, Lviv. 120 pp. Read the variety of papers regarding sustainable mountain development in the Carpathians in our newest publication: The Carpathians: Integrating Nature and Society towards Sustainability. Kozak J., Ostapowicz K., Bytnerowicz A., Wyżga B. (eds.) 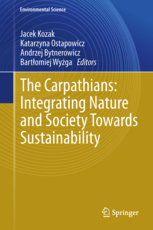 (2013) The Carpathians: Integrating Nature and Society towards Sustainability, Springer, ISBN 978-3-642-12724-3, 720 pp. Boltižiar M. (eds.) (2012) Conference Abstracts of the 2nd Forum Carpaticum. From Data to Knowledge, from Knowledge to Action, ISBN: 978‐80‐968901‐9‐4, 214 pp. Boltižiar M. (eds.) (2012) Conference Proceeding of the 2nd Forum Carpaticum. From Data to Knowledge, from Knowledge to Action, ISBN: 978-80-89325-24-5, 34 pp. Kozak J., Björnsen Gurung A., Ostapowicz K. (eds.) (2011) Research Agenda for the Carpathians: 2010-2015. Kraków, 43 pp. Ostapowicz K., Kozak J. (eds.) (2010) Conference Proceedings of the 1st Forum Carpaticum. Integrating Nature and Society Towards Sustainability. ISBN: 978-83-88424-54-0, 164 pp. Ostapowicz K., Sitko I. (eds.) (2009) Science for the Carpathians. Strategy Development and Networking Workshop, Jagiellonian University, Kraków, Poland, 27-28 May 2008. Workshop Report. Bern, Switzerland, ISBN: 978-83-88424-40-3, 46 pp.